With more homes becoming smart and digital, service providers now face the challenge of contending with increasing operational complexity in the residential network and service environments. To make matters worse, subscribers expect “always-on” connectivity, resulting in home Wi-Fi issues making up 70 percent of today’s technical support calls, according to industry first research from Analysys Mason. In order to deliver a high-quality Wi-Fi experience to their customers, network operators require a proactive solution that can rapidly identify and resolve network issues to optimize home Wi-Fi and significantly reduce operational costs. 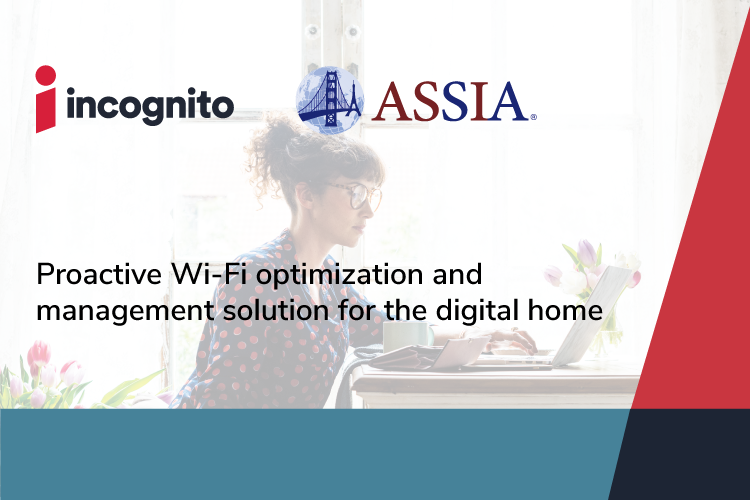 In an effort to address this need, Incognito and ASSIA announced this week a partnership to develop an integrated Wi-Fi management and optimization solution to improve the digital home Wi-Fi experience and boost operational efficiency – allowing for proactive care and operations automation. The partnership leverages Incognito’s product capabilities in digital home experience management, home network analytics, and operations automation, together with ASSIA’s CloudCheck® software solution for Wi-Fi optimization, diagnostics, analytics, and machine learning to proactively manage and optimize quality of experience for residential customers. For those planning to attend next week’s CableLabs Summer Conference event in Keystone, Colorado, Incognito and ASSIA will be showcasing the joint solution and its ability to track and manage Wi-Fi signal performance, proactively scan to determine optimal channels based on performance or speed, automatically steer devices to optimal access points, and provide intuitive recommendations to home users to maximize QoS.